New aerodynamic regulations are coming in 2019 with the aim of enabling closer racing, to improve passing opportunities. Not all the participants are happy about the changes - despite agreeing the results of research show the changes should be positive. a wider and deeper rear wing. While most of the teams agreed these changes would have a positive effect, “on balance”, not all were enthusiastic about implementing them for 2019. As the vote was cast before midnight on April 30th the FIA did not require unanimity to enforce the rule changes, with Mercedes and Ferrari the biggest teams supporting the measures - it has been suggested this is possibly in exchange for some leeway in discussions about 2021’s power plant regulations - and the Red Bull teams and Renault voting against - preferring the research to be more definitive ahead of implementation in 2021.
adding an unbroken space at the top of the rear wing endplates without louvers. In that meeting of the TWG an increase of the fuel allowance (from 105kg to 110kg) and a minimum driver plus seat weight of 80kg were also agreed; interestingly at that time Brawn’s suggestions to simplify the front wings and increase the depth of the rear wing were voted against by the teams. Aesthetically the changes will be subtle, with the pushback from the teams pertaining to the aerodynamic effect; especially how the loss of the front wing upper flap (FWUF), r-shaped turning vanes, and front brake duct winglets and axle blowing will affect the management of the front tyre wake as it progresses along the length of the car. 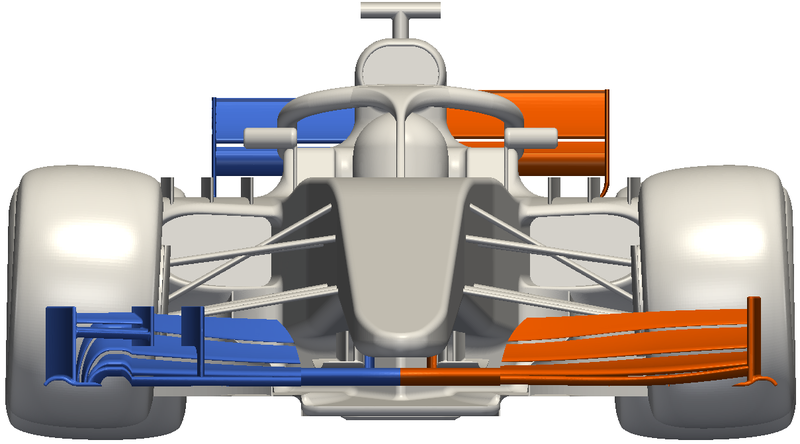 CAD representation of how the proposed 2019 front and rear wing rules (red) compare to the 2018 rules (blue). At the time of writing the exact specification of the rules have not been released by the FIA - with work be being carried out behind the scenes between the FIA and teams to define the exact wording for the rulebook to minimize loopholes. Inarguably the most important part of a Formula 1 car is the front wing, not only as a downforce producing device, but also as a means of managing the flow around the front wheels - which when done correctly can significantly improve downforce for the rest of the car. It is the management of these flows that FOM and the FIA are aiming to restrict. The function of the front wing can broadly be split into three distinct operations; 1) up to plus or minus 250mm of the car centreline is a prescribed shape - the FIA section - defined in the regulations to be aerodynamically “neutral”, being a symmetrical section wing with a slight nose up incidence. This section was added after the researched performed by the original overtaking working group, who found that the central span of the front wing was most significantly affected by an upstream car. 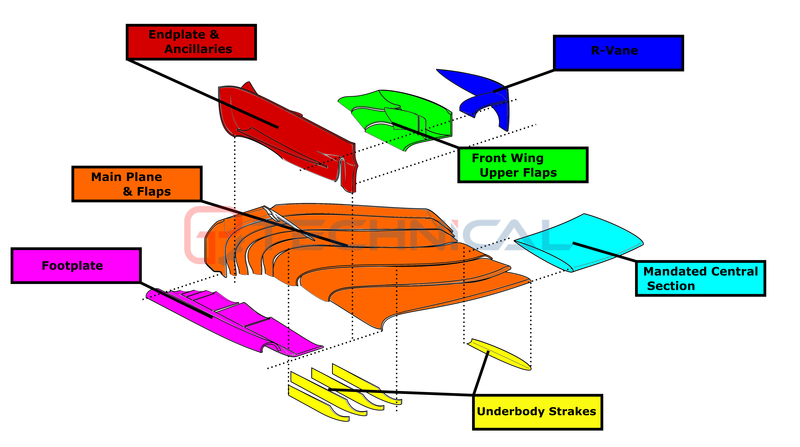 Labelled diagram of a 2017/18 front wing. 2) Where the main wing joins the FIA section the discrepancy in pressure between the “neutral” wing and downforce generating wing causes a vortex to form - named the Y250 after the span of the FIA section. Early in development for 2009 the teams discovered that the Y250 vortex was hugely beneficial downstream of the front wing - driving downwash and outwash to help divert the front tyre wake away from the underbody, ultimately improving underbody downforce. This inboard region of the front wing is subject to a lot of development, along with vanes or capes under the nose and the bargeboards, over the last 9 years as teams try to entrain the flow into a strong and stable vortex. General path of Y250 vortex downstream of front wing. 3) The outboard part of the wing around the tip produces a complex array of vortices with the intention of managing the front tyre wake. This region includes the endplate (FWEP) and footplate (FWFP) along with the complex cascades of r-shaped (inverted L or ⅂) turning vanes (rTV) and the upper flap (FWUF), which sits above the mainplane at the front of the wing. The modern FWEP acts less like a traditional endplate, with an extreme camber aiming to turn the air flowing around it outwards, away from the front face of the front tyre. The FWUF plays an important role in diverving air over the front tyre where the rotation of the tyre (against the direction of travel) causes flow to separate from the top surface - producing a large amount of aerodynamic drag. By aiming air upwards with the FWUF the difference in velocity at the top of the tyre is reduced and the flow separation delayed. Front wing tip vortex system and flow paths. In 2009 the front wing span was increased to match the maximum width of the car (1.8m), but after a speight of punctures and lost endplates the span was reduced in 2014 to 1.65m - which made the aggressive outwash endplate design a necessity. When the car track was increased to 2m in 2017 the front wing span was also increased to 1.85m - so that the overlap to the wider front tyres was consistent to the 2016 car. For 2019 the front wing will be increased again to the maximum width of the car, so a worry for 2019 must be the potential for a higher rate of first corner incidents - as the drivers jostle for track position. 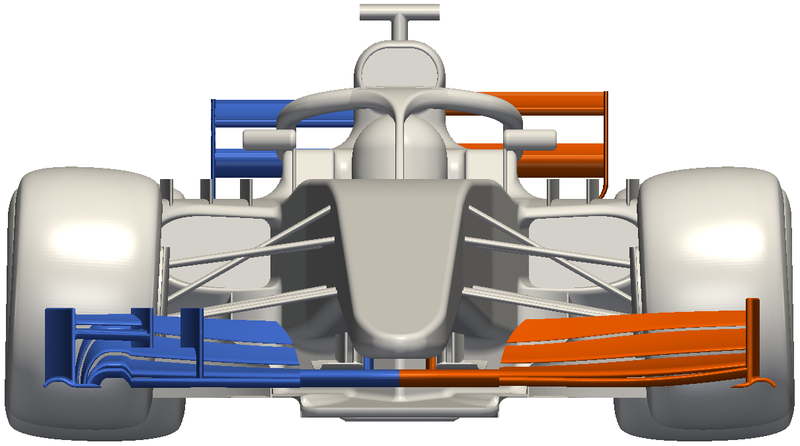 The simplification of the wing starts with the loss of the cascades (the FWUF and rTVs) which will significantly reduce the outwash capacity of the front wing - and will ultimately lead to higher front wheel drag. The FWEP is also being moved outboard by the increased front wing span, which will reduce the necessity to divert the airflow around the front tyre quite so aggressively - and teams may aggressively camber the outboard section of the front wing to push air over the front wheel. It also seems like the FIA will mandate a standard FWEP, or at least restrict freedom of design, to try and fix the flow path of the FWEP and FWFP vortices. The aim being to reduce the air being pushed outboard of the front tyres, which increases the width of the wake - and harms the aerodynamics of a following car. Another simplification discussed is a limit on the number of strakes allowed on the underside of the wing - limiting teams to two per side where currently upwards of four is the norm. The strakes have a number of functions, as vortex generators, turning vanes, and a means of maintaining the low pressure (downforce) under the wing. The final simplification appears to be a limit on the number of elements allowed in the front wing volume - a rule already enforced for the rear wing. The number of elements is not a means of generating more downforce, but will instead affect how the wing behaves as it moves closer or further from the ground. The low position of the front wing means it's ground clearance is significantly altered by small changes in ride height, which can stall the front wing when the car pitches forwards under braking - when the car needs front grip the most. This could lead to a lower rake (flatter attitude) philosophy than pioneered by Red Bull and copied by most teams on the grid in the last few years - to move the front wing further from the ground. 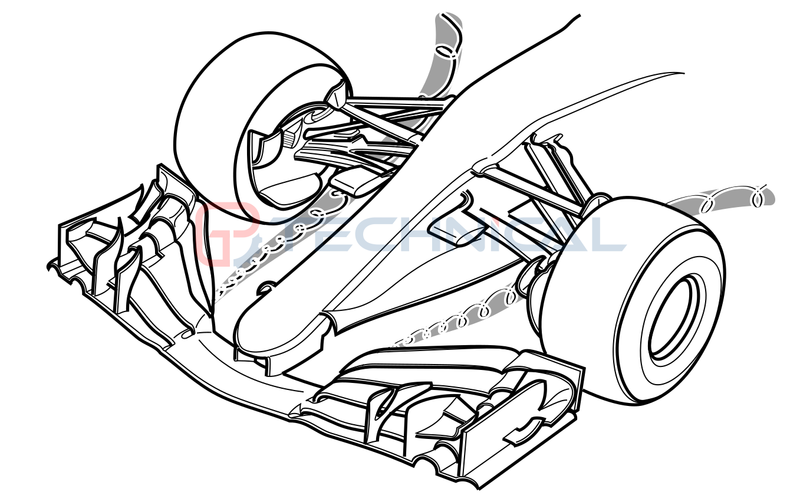 The brake ducts are the only aerodynamic elements which are permitted to move relative to the reference plane in normal operation - fixed as they are to the suspension uprights. As the rules on the brake ducts are relatively open, teams are able to fix aerodynamic elements within the air duct volume which are not strictly for the purpose of cooling the brakes. 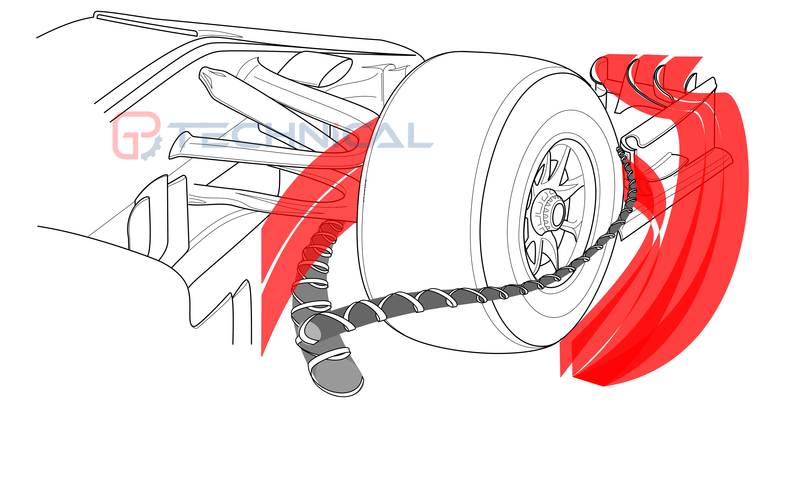 A key example of this is on the rear brake ducts, where teams use a complex stack of winglets to help drive upwash - pulling the tyre squirt away from the diffuser surfaces. a) A plane parallel to the ground situated at a distance of 160mm above the horizontal centre line of the wheel. b) A plane parallel to the ground situated at a distance of 160mm below the horizontal centre line of the wheel. c) A vertical plane parallel to the inner face of the wheel rim and displaced from it by 120mm toward the car centre plane. d) When viewed from the side the ducts must not protrude forwards beyond a radius of 330mm from the centre of the wheel or backwards beyond a radius of 180mm from the centre of the wheel. 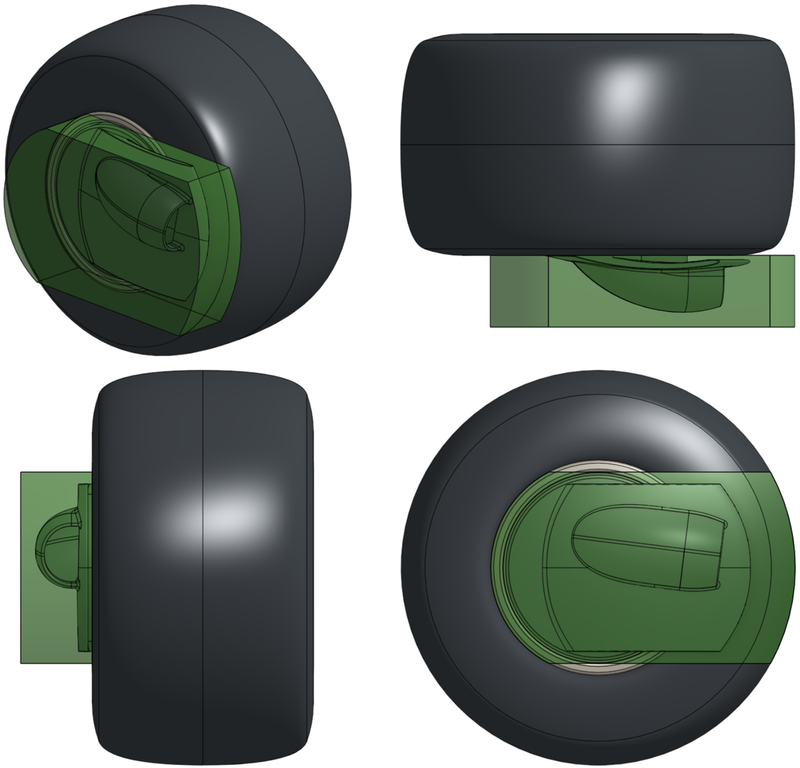 e) The ducts may not rotate with the wheels nor may they, or any of their mountings, protrude axially beyond the outer face of the wheel fastener. f) No part of the car, other than those specifically defined in Articles 12.8.1 and 12.8.2, may obscure any part of the wheel when viewed from the outside of the car towards the car centre plane along the axis of the wheel. All measurements will be made with the wheel held in a vertical position. Simple front brake duct and cowl within brake duct volume. The FIA are also clamping down on the blown axle - another tool used by teams to help push airflow outwards around the front of the car but not one utilized by all teams in 2018. This is perhaps the most controversial of the rule changes - as it proposes to increase the efficacy of the DRS effect. The volume in which the rear wing sits, like the front wing, is defined as a height, length and width, set a certain height above the reference plane (lowest point on the car bar the wooden plank). The box depth and width are to be slightly increased, meaning the wing is taller and wider. This will slightly increase the rear wing downforce which, along with the front wing changes, may slightly change the balance of downforce away from the floor. 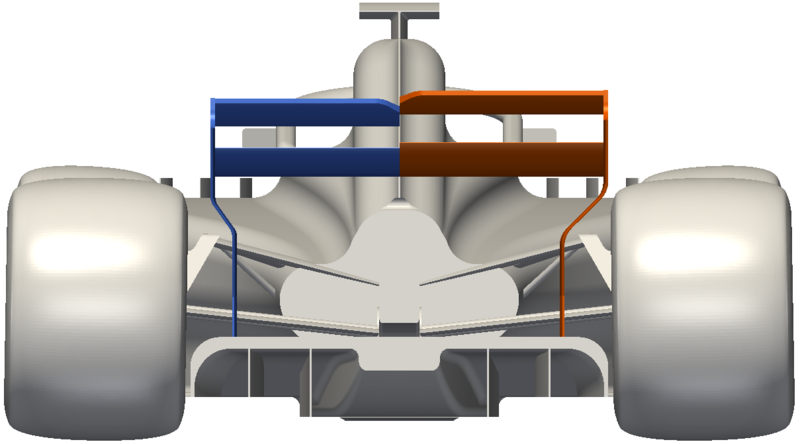 Comparison of 2018 (blue) and 2019 (red) rear wing rules, DRS open and shut. 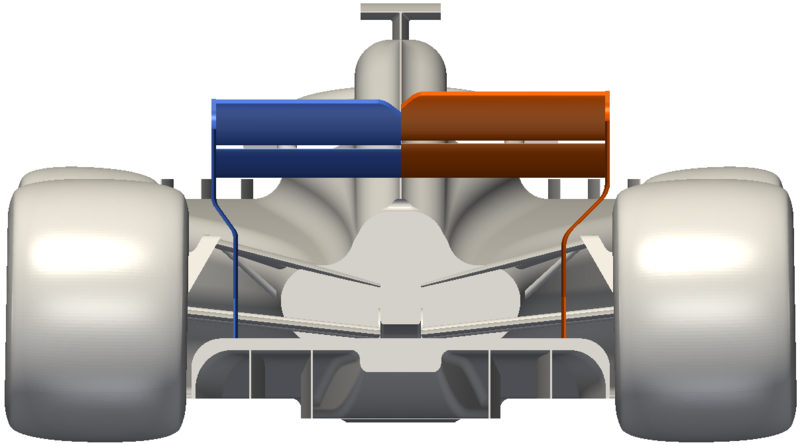 The other rear wing change is the loss of the drag reducing endplate louvers, which will slightly increase the strength of the upper rear wing tip vortex, a significant constituent of the wake behind the car (for a more in depth analysis of how the rear wing endplate louvers reduce drag see the feature on rear wing endplate design). 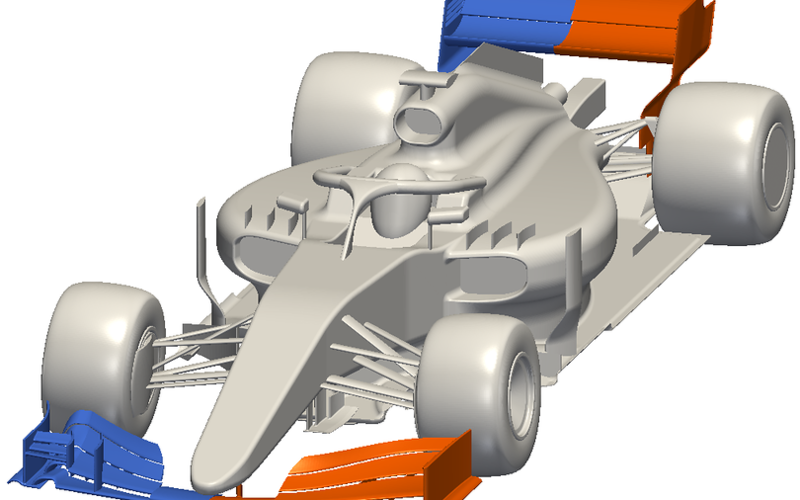 In theory increasing the downforce from the rear wing should help to push the wakes of the floor and rear wheels upwards, although the change of rear wing downforce may not be significant enough to produce this effect. 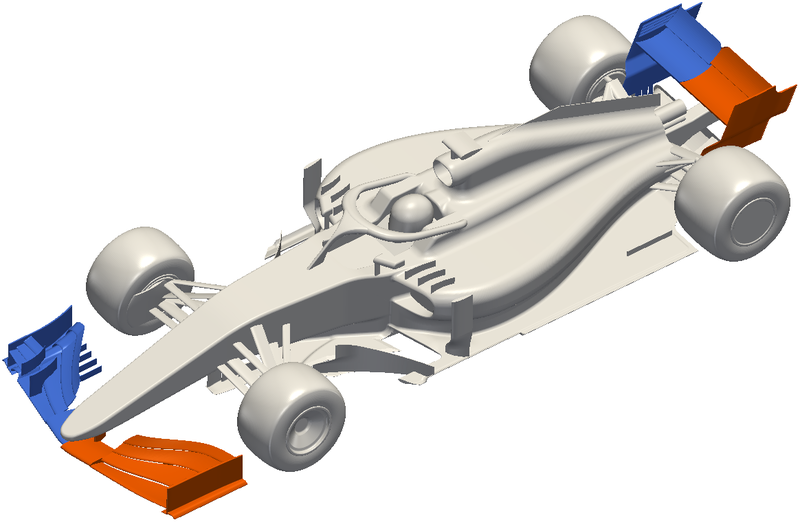 The increased blockage of the rear wing, along with a strengthened tip vortex will increase the drag of the cars - which is where the widened DRS slot gap comes in. The current rules mean the rear wing must have a gap between the mainplane and flap of 10mm to 15mm - which can open up to 65mm when the DRS is active. This will be increased to 85mm in the 2019 rules. The difference in the drag between the open and closed DRS flap will increase the overspeed for the following car, and should lead to more overtaking opportunities - whether the DRS effect will be too strong will come out in the wash.
What will be the effect of the changes on overtaking? When it comes to the actual effect on the wake on overtaking, the proof of the pudding will be in the eating, but the result will likely be subtle as the same basic structures will remain in the wake. The rear wing endplate vortices will be slightly stronger, which will help to drive the wake upwards, albeit this won’t be a significant difference. The main benefit should come from the loss of the complex cascades on the front wing - which when disturbed by a preceding car impact the whole aerodynamic system. This will slightly reduce the total downforce lost when following another car. Simplified diagram of key vortex structures in wake comparing 2018 rules (blue) to 2019 (red). These changes are not going to make the typically dull races at Barcelona or Monaco into overtaking extravaganza’s, but may help on other circuits where the overspeed required to overtake is more marginal - such as the normally excellent Montreal GP. The main points of contention will be how the more powerful DRS effect impacts the ratio of “normal” overtakes to DRS "drive-by’s", and how many drivers are affected by lost wings or punctures from first lap incidents.